Artistically we are able to fuse contemporary and realistic elements in our public art and smaller sculptures, always being inspired by the human forms. 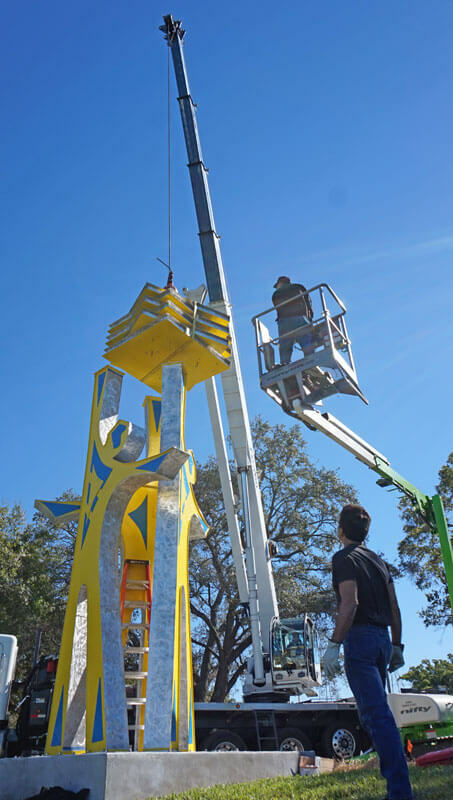 We kept in mind while designing our monumental sculpture, “Reaching for Knowledge,” the interest of the committee for the work to be iconic and that energetically and dynamically serve to identify its mission: knowledge, community, and empowerment. These three concepts are represented by the three human figures holding a stack of books. Knowledge is represented by the books held by the three persons. The three persons represent the community and its diversity. Empowerment is represented by the three people reaching upward achieving personal growth, becoming stronger and more confident. All these as a consequence of having reached the knowledge. The same view can be seen from three different angles: vehicles and pedestrians from Drew Street (eastbound- westbound) and also from the library’s parking lot. Abstract and figurative, classic and contemporary, our sculptures are made of strong aluminum, but appear soft and fluid. The bent forms incorporate exposed bolts and colorful accents. Color is very important to us. We believe colors are so important in people’s life especially in environments where a colorful sculpture(s) will attract the visitors’ attention and make them wonder about its meaning. We see the world in countless colors, diverse and vibrant, and this is apparent in our creations. Dynamic and exciting, our artwork speaks of colors, magic and poetry. 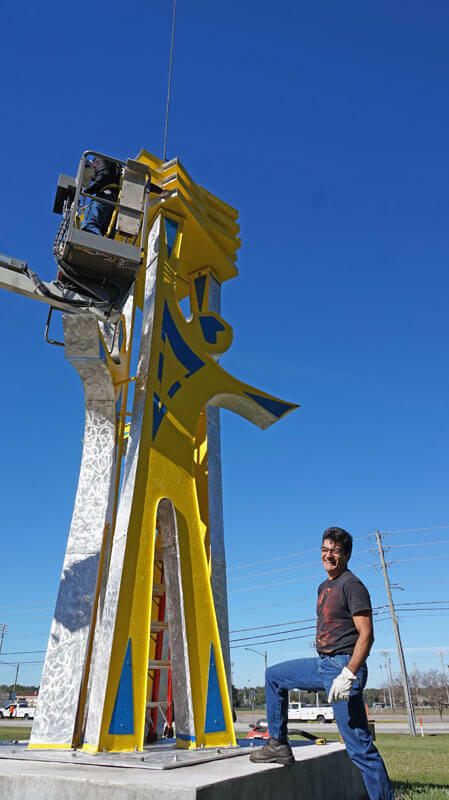 Colombian-American Artists Gus and Lina Ocamposilva are husband and wife team of sculptors who have obtained enormous respect in North America. Self-taught sculptors, 12 years ago: He aims for the welding torch. 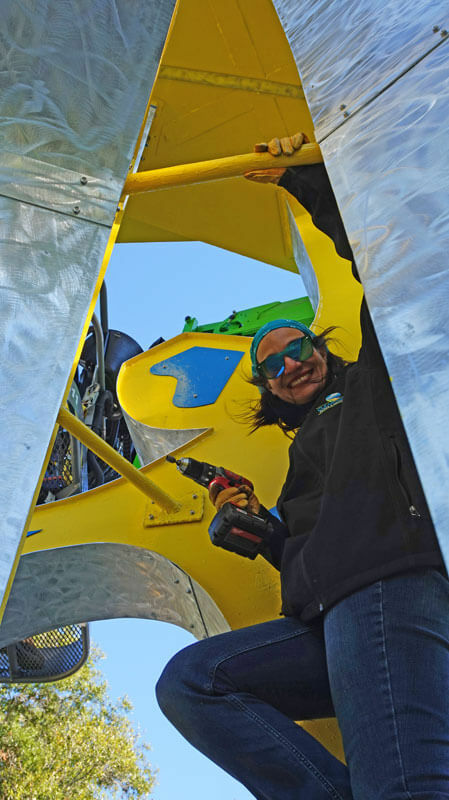 She cuts the metal sheets. Some days, vice-versa. 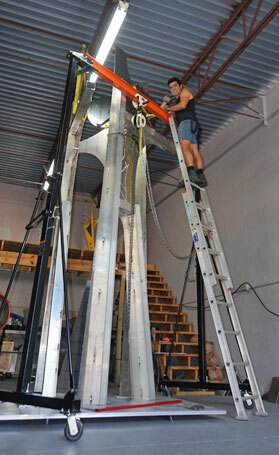 Together they make and install metal sculptures around the world and share the same passion for art. Gus Ocamposilva studied Murals at Massana School of Barcelona and painting procedures at Barcelona University, Spain (1992-1995). 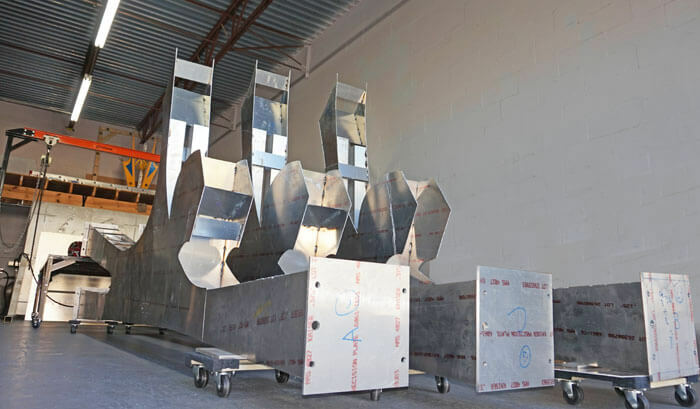 During Spring of 2013, they were invited by the City of New York to exhibit three 13ft sculptures specially designed to be placed along the East River Park Promenade in Manhattan. 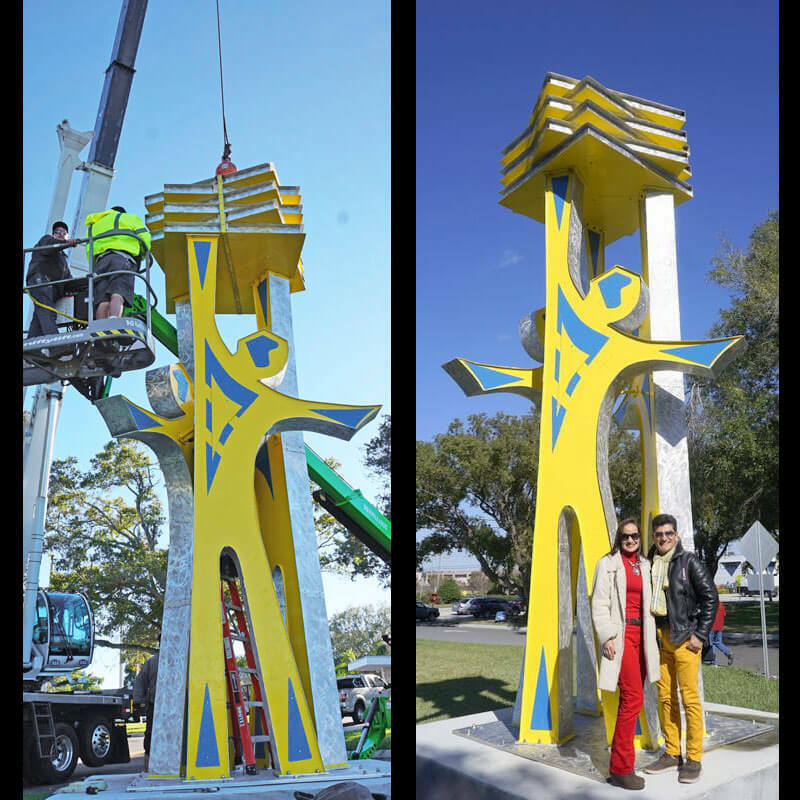 To date, they have installed more than 60 monumental sculptures between permanent commissions and temporary public art projects in cities such as Chicago, Atlanta, Miami, NYC. This has given them huge experience working with public art. 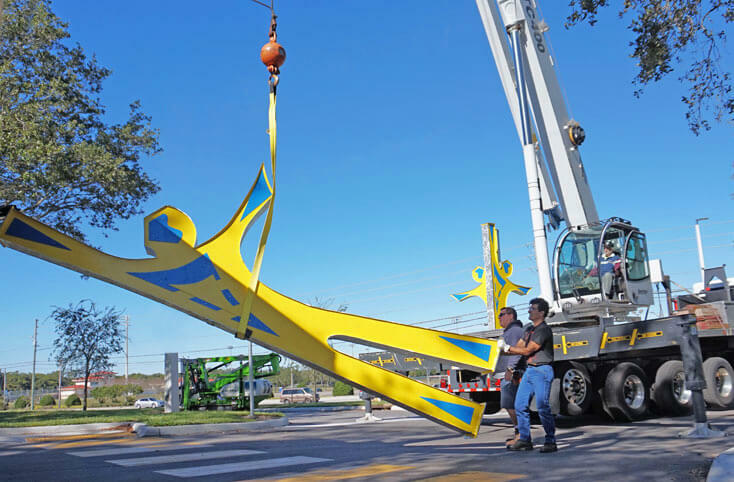 The monumental sculpture “Reaching for Knowledge” created by Gus and Lina Ocamposilva is installed in St. Petersburg College in Clearwater, Florida. It was dedicated in December, 2018. This article was submitted to Sculpture Digest by the artists who retain copyright of all images. Click here to see more examples of this duo’s public art on their website.